When I was a freshman in college, my roommate was obsessed with Food Network — Emeril in particular. At any given hour, you could hear “BAM!” or a round of applause whenever the word “garlic” was mentioned echoing from our dorm room. Up until that time, my skills in the kitchen were pretty much limited to the microwave and the can opener, and I definitely give credit to Food Network for teaching me the basics. I rarely watch Food Network anymore (most of the chefs drive me crazy), but occasionally I’ll land on FoodNetwork.com to dig for ideas. That’s how I came across this salad. I tweaked the original recipe quite a bit, but the summery-ness of it still remains. Slightly sweet and slightly savory with a variety of textures and colors, it’s a dish that’ll leave you feeling satisfied. Bring wheat berries, vegetable stock, water and salt to a boil. Cover, reduce heat to simmer, and cook for one hour. 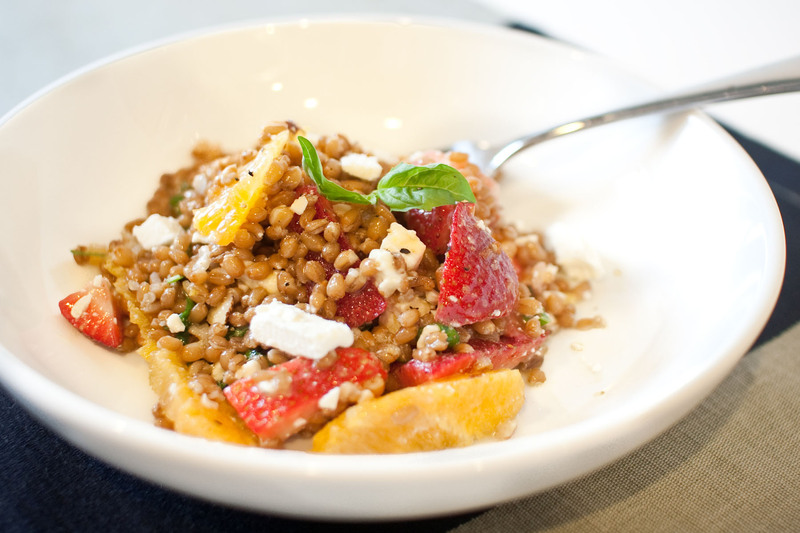 Drain wheat berries and set aside to cool in a large mixing bowl. 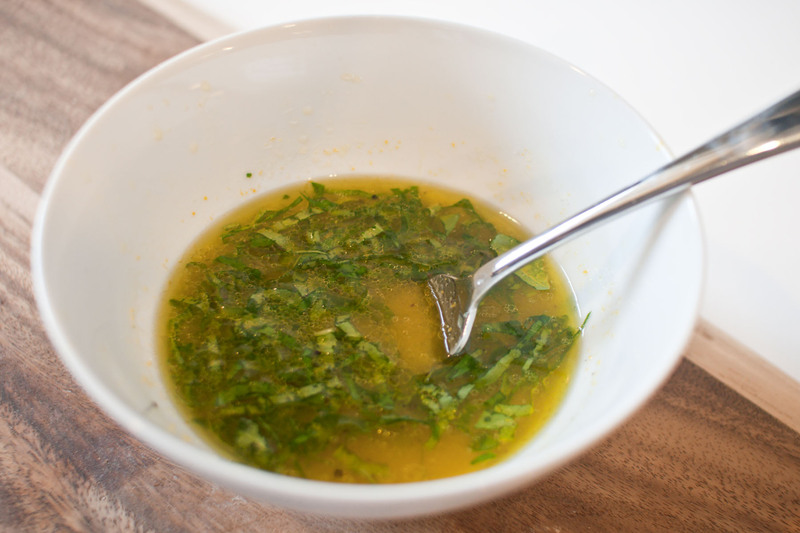 Meanwhile, in a small bowl, make the dressing by whisking together the orange juice, olive oil, orange zest, honey, basil chiffonade, salt and pepper. 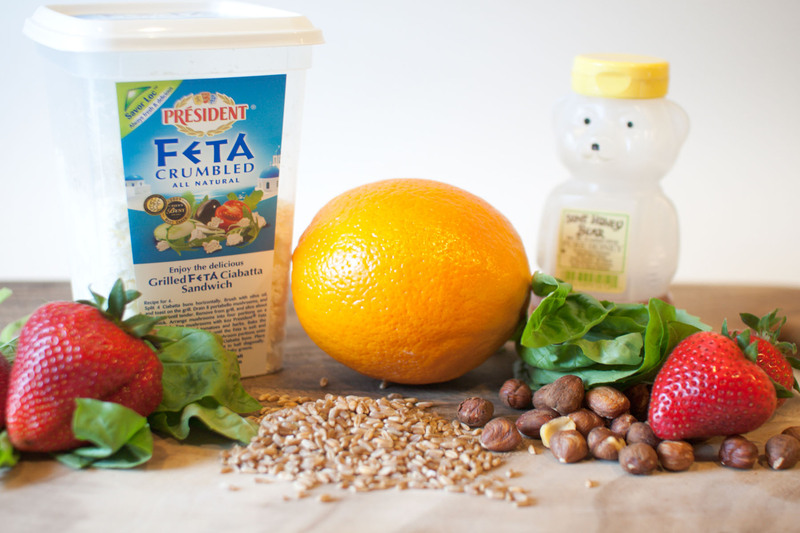 Add the dressing, sliced strawberries, orange segments, feta and hazelnuts to the wheat berries and toss to combine, making sure the dressing is evenly distributed. Sounds so refreshing but Ihaven’t ever seen a wheat berry before… so I guess I would substitute it with something else. Looks great. I need more summer salad recipes that don’t rely on lettuce as the main ingredient. Thanks! Yum! I’m totally making this! June is strawberry month for our seasonal potluck! If you want to be the first to post your strawberry recipe, we’d love to have you! Yum! I love wheatberries. I normally use them in breakfast dishes, so it’s always fun to have an excuse to break them out at other times of the day. Thanks for the great recipe! This is a great summer salad recipe… it’s light, definitely delicious, and refreshing. Oh how much I adored Emeril and his *BAM and love of garlic..Your dish is really incredible! I love combination of flavors and your photos are fantastic..making my hungry!! !